Last week, noting that I didn’t seem to be enjoying it much, Joel (my boss, the machine tool instructor, and the MTL building manager) asked if I’d prefer something a little more substantial and padded. I said I would, and he said it was OK with him if I got in touch with Disabled Student Services, since they handle special-furniture requests on campus, and made such a request in the department’s name. So I did. 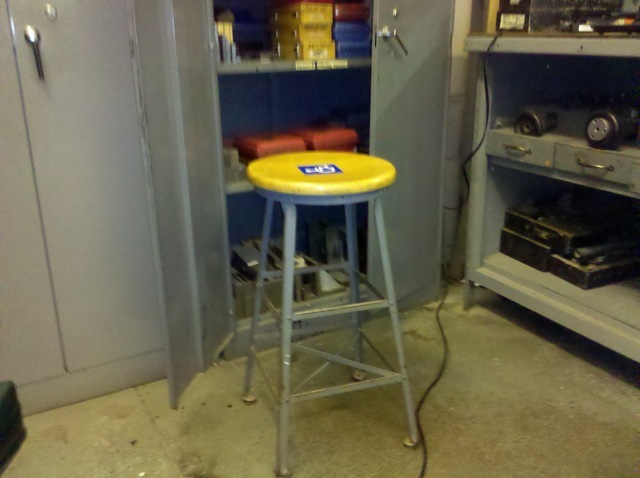 Monday I came in for my night lab shift and found… a second, identical Angle Steel stool, with a tag on it saying “FOR BEN HUTCHINS, MTL CRIB”. Apart from the tag and a label with the international accessibility symbol on it (see above), it was exactly the same as the one we already had. The first thing we decided was that we didn’t need to start from scratch. 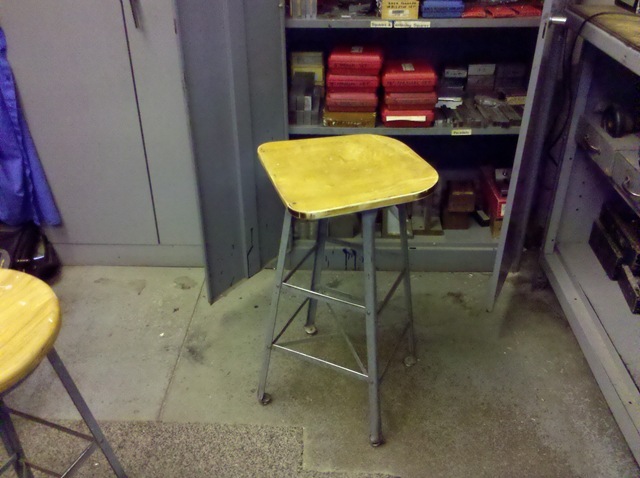 The Angle Steel stool’s metal structure is plenty adequate for our purposes; it just needs a better seating surface. So we dismantled one of the Angle Steel stools, which was a simple matter of unscrewing the wooden disc from the top of the frame. Then Joel went and found a donor chair somewhere else in the building (he’s the MTL facility manager, remember, he can do that). 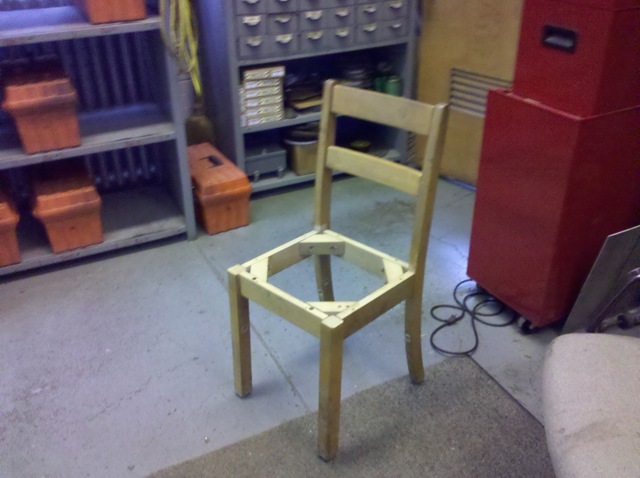 This was a regular wooden chair, like you would find in a kitchen. We actually looked at a couple of them and decided that one would come apart more easily, and yield a part more suitable to the purpose, than the other. So Joel knocked out the stretchers, to make getting the drill in there easier, and we unscrewed the seat base from our donor chair. 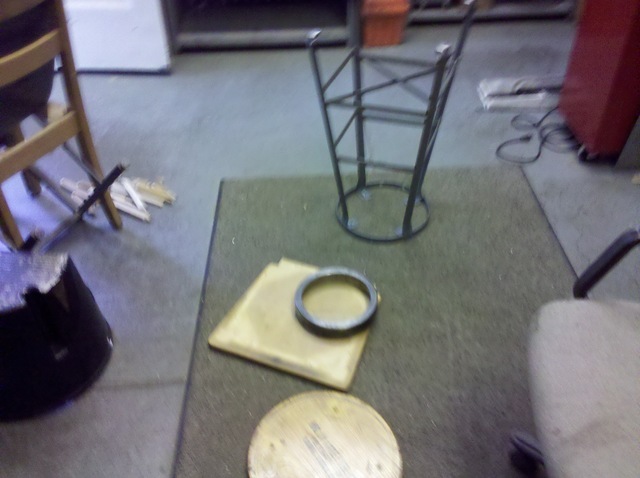 Then it was a relatively simple matter of marking out a radius (that’s what’s going on with the big metal ring and the square board in the photo above) and trimming the corners of the seat base a bit. The result is not much different from the old version, but with a more substantial seating area, and provides a better platform for adding upholstery later, which Joel is rather keen to do once he has a chance to assemble the materials. I’m sitting on it right now for my night lab shift, and I have to confess it’s not that much better than the old version. I mean, it’s still hard and there’s still not much of anyplace to put my feet. Still, it does offer better support, and once it’s upholstered it should be very nice indeed. And besides – it’s an engineering project! If the foot situation is uncomforable, perhaps you could attach a small metal footrest?